Thanksgiving Time is easily overlooked because it comes right in the middle of our getting ready for Christmas. However, it is too wonderful of an opportunity not to make it musically special. I know many choir directors don't feel they have time to be concerned with Thanksgiving because Christmas takes too much of their time. Let me encourage you to do a mini-Thanksgiving musical that would have pull-out possibilities to use on any given Sunday. 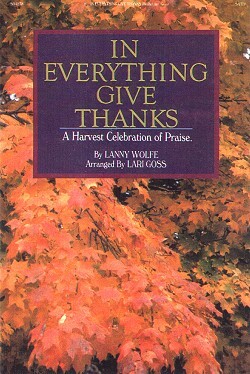 I, along with Lari Goss, have birthed one Thanksgiving mini-musical In Everything Give Thanks. I would suggest starting on this late Summer or the first of September at the latest. Plan on singing each of the four songs in some service between September and November 25th. This will give you four new arrangements for your regular choir repertoire and give you much more mileage from these songs than just using them for your Thanksgiving Service. When you do your Thanksgiving service add the narrations and it will be very special. You can't sing a song like In Everything Give Thanks too often. To do it only in a Thanksgiving framework shortchanges many possibilities that the song can offer your congregation. Sometimes choir directors and ministers of music expend so much energy in their Christmas and Easter productions that they are not often anxious to take on another musical during the year. With Mother's Day, Father's Day, and July 4th, it seems like there is no convenient time to consider choir involvement of a 60-minutes commitment because they would be starting Christmas around the start of school in September. Let me encourage you to consider a nonseasonal work such as Greater Is He or We Are The Church to come somewhere after Easter and before Fall. The wonderful luxury of "Nonseasonal Musicals" is that they usually comprise songs that all have pull-out possibilities. This means that while you are learning all the songs from the musical, you can be singing selected songs from the musical (without their narrations) on different Sundays and then add narrations and any drama and multi-media for the actual performance of the musical. Also, because of the nature of a nonseasonal musical, you actually have a lot of flexibility, such as not using all of the songs from the musical or by substituting some other songs that your choir may already know that you feel would complement the overall theme of the nonseasonal musical. You also have a lot of flexibility in performing nonseasonal musicals. For instance, you might give several performances at the end of August and turn around and give a few more performances at a later date such as October. As a songwriter-publisher I always feel a need to allow opportune moments during any nonseasonal musical for both Christians to be able to reconsecrate themselves and for sinners to make a commitment to the cause of Christ.